FTP is a very common method of transferring files from your a remote machine to your local desktop. Your first instinct for improved bandwidth might be to pay for it but there is more to speed than just your Internet bandwidth. Testing, tweaking and testing again might be one of the best ways to optimize your resources for FTP speeds. In some cases, File Transfer Protocol (FTP) is a critical key for some application functionalities. It plays one of the most important roles in a Seedbox or VPS. A good file transfer speed will guarantee a good user experience. The most difficult step when optimizing FTP speed is to know what you already have. When you are familiar with your resources and accept them, you will have the ability to optimize as you wish. Don’t rush and buy more bandwidth or a bigger computer. First get to know what you already have in hands. Knowing what speed to expect gives you more control and patience when transferring files. Get closer to your resources, computers, network, bandwidth, the FTP server and you will be able to predict download times. Once you know your stuff and have tweaked them properly, go ahead and buy a faster bandwidth. To increase FTP speed, start by getting to know your own resources. Your machine and its network define your FTP download speeds. Which resources are you using to connect to the Internet? Take full advantage of your bandwidth by accessing it with an adequate device. The capacity of each of your resources should be somehow balanced. For example, you might have a high-speed fiber connection but are accessing it with an old device. Using a computer with low CPU and processor will not affect Internet speeds. It is your experience that will be affected. Are there several devices connected on the same local network? No matter how fast is your bandwidth, if there are many devices connected to the same network, the speed will be slow. Each device connected to the Internet router/gateway will take a bite of the bandwidth. Try connecting to a dedicated network. Do you have other services consuming your bandwidth? Your resources might be fast and healthy but you are demanding too much of them. Other bandwidth consuming services such as streaming, P2P, video conferencing, etc, will affect your speed. Most ISPs advertise their Internet download speeds in Mbps. While it is technically correct, it confuses many consumers. 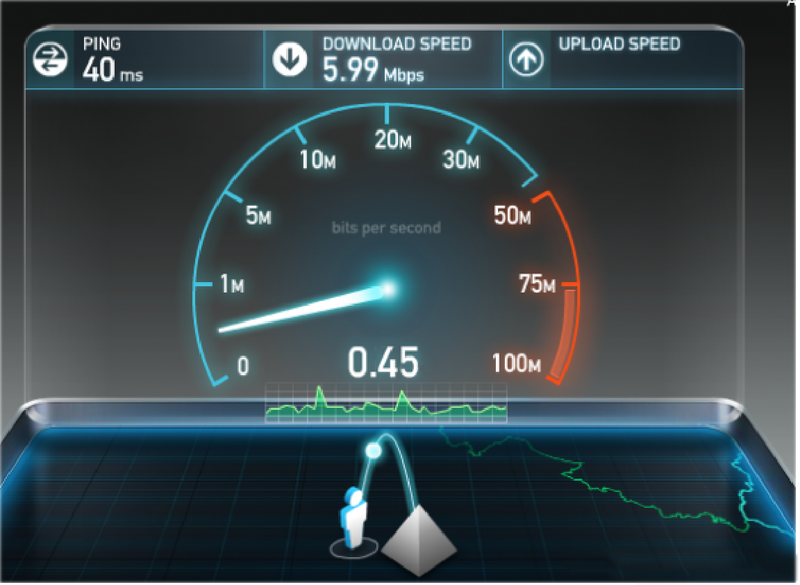 Some other ISPs display amazing download speeds but forget to mention upload speeds. A very important factor in FTP speeds. To know your real bandwidth contact your ISP or measure it yourself using testing tools. One of the most popular bandwidth testing tools is SpeedTest by Ookla. The result of this test gives you an average download/upload speed. The test is free, so run it as much as you need, until you get a good idea about your speed. Also test it using different devices such as mobile, tablet, desktop, etc. If your speed result is less than what it should be, try restarting your devices, including the router. If the bandwidth is still slow and not what you are paying for, contact your ISP immediately. 1.3 Speed values: Mbps is not the same as MBps. Be aware of the values you are using to check your speed. Speedtest will give you results in Mbps and your download application will show MBps. There is a big difference between MBps and Mbps. Megabyte (MB) is used for file size, so MBps is the rate of file transfer. It takes 8 Megabits (Mb) to equalize 1 Megabyte (MB). Mbps is used for download/upload connection speeds. A 150 Mbps speed will NOT download a 150 MB file in one second! But if you divide it by 8, it will average a file transfer rate of 18.75 MB per second. The following table shows some common speed values and its difference. Remember that these are theoretical values. In real-life, there are overheads, latencies, delays etc. A 150Mbps ends up being around 15MBps when you consider overhead. With 150 Mbps you will be likely to transfer a 15 Megabyte file under 1 second. There are other special tools online that can help you in your download time prediction, including overhead. Use a file transfer time calculator such as the “Tech of the Internets” calc. Input your speed, file size, and overhead percentages, the calculator will give you an approximate time that a file will take to transfer. 1.4 Your speed depends on the destination. It is difficult to predict the overhead when you don’t know the time it takes to reach the FTP server and what happens when it’s reached. Where is the FTP Server? A trick is to know the geographical distance between FTP client and server. Unless you move next door to the FTP server, there is not much you to do here. But knowing the physical distance will help you understand the added time delay you should expect. Geographical distance plays an important factor in Server/Client services such as FTP. If the FTP server sits on the same physical network, the download delays will be minimal. But if the server sits on the other side of the world, the download delays will increase. FTP Servers are usually strategically located to provide the lowest latency as possible. You might be lucky to have the FTP server located right in your same city and luckier if it’s dedicated to you. Is the FTP server dedicated or shared? With a dedicated FTP server you can enjoy the highest speed and performance possible. But if you share it with other users, the speed will be restricted and certain capacity allocated to each user. A shared FTP server might have a maximum speed per connection, thus limited speed. To avoid waiting for speed, RapidSeedbox offers affordable, fast and reliable dedicated servers. If you don’t have a server to test transfer rates, you can use a free online FTP server. A popular and reliable FTP online tester is, Tele2Speedtest. You can find out about your maximum speed without having a username and password. Their service allows you to test your FTP using different methods. Test your upload/download transfer rates with a variety of test-files via HTTP or FTP. Don’t worry about their FTP speed test server, it is secure and fast. Their server maintains a high-throughput of close to 10Gbps. The full responsibility of FTP speed does not fall on the client itself. As said before, there are many factors that can add up to your slow speed. Yet, choosing a light and well developed client can contribute. The following list highlights 5 popular FTP clients that are light, fast and powerful. These tools are optimized right of the box to maximize FTP speed. 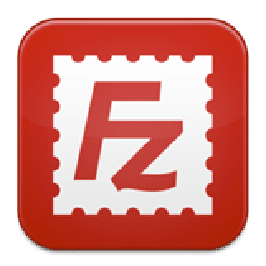 FileZilla, the most popular and open-source FTP client/server among administrators. Filezilla is free, light and updates regularly. If you are looking for speed optimization, it comes with features such as “Concurrent Downloads”. Filezilla supports FTPS and SFTP. If you are looking for a fast client with worldwide support, FileZilla is the right one. WinSCP another free, fast and lightweight client. WinSCP client supports FTP, SFTP, FTPS, SCP and WebDAV. The only limitation is that WinSCP is exclusive to Windows OS community. If you are looking for security and speed, FlashFXP is the right client. It supports FTP, FTPS and SFTP. However, this client is only supported for Windows. If you are looking for speed and have an Apple computer, Transmit might be your choice. It comes with a “twin-turbo engine” which boosts speeds up to 25x. Transmit can transfer files to your cloud services and still supports traditional protocols such as FTPS, SFTP and WebDAV. Transmit is only available for MAC and is not free. This client comes with a very simple and easy to use interface. CuteFTP Pro has features such as resume support, segmented downloads, and automatic file detection. This client supports all transfer protocols. CuteFTP Pro is not free. Because of encryption overhead, FTP is slightly faster than other protocols. Although FTP is still around, it is not recommended due to security reasons. FTP by itself can be very insecure because it sends passwords in plain text. But speed is not the most important factor that differentiates FTP, SFTP, FTPS, and HTTP. You might be more limited by the speed of your network than by the overhead of the protocols. File transmission protocols are defined at the FTP server. The client will have to adapt to this conditions. The following is a brief comparison of the most popular file transfer mechanisms. With this in hand, you will know what to expect from your chosen protocol. Even FileZilla will warn you, FTP by itself has no encryption whatsoever. Instead, connect through either FTPS or SFTP (as defined by the server). 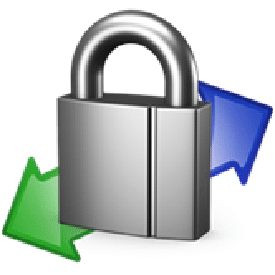 FTP/SSL (FTPS) is an extension of FTP which adds support for SSL/TLS encryption. It takes FTP and covers it in SSL/TLS encryption. It is becoming common to use FTPS instead of traditional FTP. SSH Transfer Protocol (SFTP) it is not related to FTP and works very different. SFTP uses a fixed window size that can limit speed. SFTP also requires only one port 22 to establish a connection, so it is friendlier to firewalls. The difference between the two methods (FTPS and SFTP) is performance and speed. There is a lot more overhead going on in SFTP. FTPS is more likely recommended if you are looking for higher transfer speeds. FTPS is a more appropriate protocol for masses or a larger public. While SFTP is commonly used for a limited number of users. FileZilla supports both FTP over FTPS or SFTP. FTP servers at RapidSeedbox support both protocols. Check this guide to learn how to log into your Seedbox using SFTP. Check the following guide for more information on how to log in to your Seedbox with explicit FTPS. 3.2 FTPS vs HTTP-based WebDAV. What are the main speed differences between WebDAV and FTPS? Both protocols serve the same purpose but are very distinct in functionality and speed. Web-based Distributed Authority and Versioning (WebDAV), is an extension to HTTP. WebDAV allows users to manage files on a remote web server. Since it is HTTP-based, it doesn’t need more firewall ports to be open, other than common port 80. WebDAV pipelines many transfers over one TCP connection. It doesn’t need to create many channels when downloading many files, as FTPS does. On the other side, the overhead of FTPS is substantially lower than WebDAV. So if you plan to download or upload many small files, FTPS will work faster. The greatest advantage of WebDAV over FTPS is that it supports features such as partial downloads or locking. Most of the FTP configuration takes place on the server. Yet there are still some FTP client optimizations that can improve your experience. Purchasing the fastest speed and lowest latency connection is the most obvious choice. But most of the time, the FTP client can be optimized to get the maximum speed from your current connection. This feature breaks up a file into smaller parts, downloads each part and combines them together when finished. For example, you are trying to download a single file with a 1 Mbps speed but you are only getting 100KBps. The feature breaks up the single file into 10 parts, each one requiring their own connection. If each file can be downloaded at 100KBps, then you can accomplish 10x the speed. Some FTP clients that support segmented downloads are CuteFTP Pro and Smart FTP Pro. FTP servers limit each session to a maximum download speed. 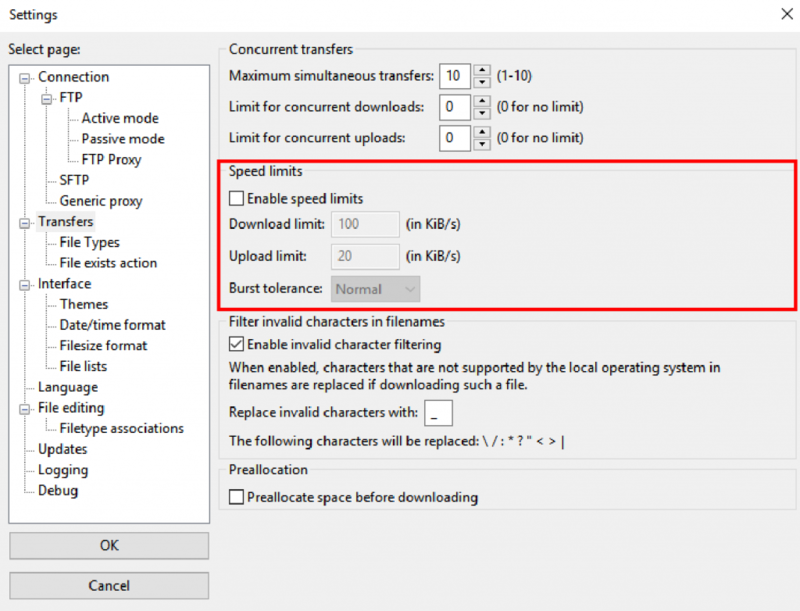 To optimize FTP speed on the client side, adjust the “maximum simultaneous transfers”. It will allow bypassing some limitations defined by the server. Concurrent downloads increase FTP speed, by allowing many concurrent connections to the server. The purpose of this feature is to download many files (a folder) at the same time. Downloading a single big file is not the goal of this feature. To change the concurrent values in FileZilla, go to Edit > Settings > Transfers > [Concurrent Transfers]. In “Maximum Simultaneous Transfers”, notice that Filezilla has 10 as the greatest value. Make sure this value is high so you can see an improvement in file transfer speed. Using a value higher than 10 is not possible in FileZilla because it can overwhelm some FTP servers. “Limit for concurrent downloads and uploads” below can create balanced downloads and uploads. For example, if you limit concurrent uploads to 3, you can only upload 3 files at a time. If you limit concurrent downloads to 7, you cannot download more than 7 files at the same time. Check whether you have defined an FTP speed limit for your FTP client. FileZilla FTP client comes with unlimited transfer speeds by default. Check whether a transfer speed limit is defined. In the case of FileZilla, go to Edit > Settings > Transfers > [Speed Limit]. If the “Enable speed limit” box is checked, disable it. Now you know your own resources, you tested speeds and use the right client. But somehow you are still facing slowness in your file transfers. What’s next? The following troubleshooting guide will help you discover causes and end slow FTP speeds. Antivirus and firewalls are the first line of defense against malware and intruders. But despite their many benefits, they can degrade Internet speed and computer’s performance. But don’t go and disable your security systems, it is not advisable. Malware might be the No.1 reason for your slow Internet speed. A computer infected with Malware can slow down your speed 10x more. If your Internet speed is already slow, do a deep scan to find potential Malware. Some antiviruses run passive background quick scans and backups that slightly degrade performance. While others do more aggressive real-time scans that can slow down the Internet connection. Speed degradation is more about the software’s configured level of security rather than the software itself. Firewalls inspect every packet attempting to enter or exit the network. Allowing some packets and discarding others. Decision-making on each packet can have a slight degradation on the Internet speed. Depending on the manufacturer or its configuration, some firewalls create complete traffic bottlenecks. Test your security systems against FTP downloading. Turn off your antivirus temporarily and download a test file from a reliable FTP server. Enable antivirus and perform the same test. If speed is a bit or no different, your antivirus might not be hurting your speed. 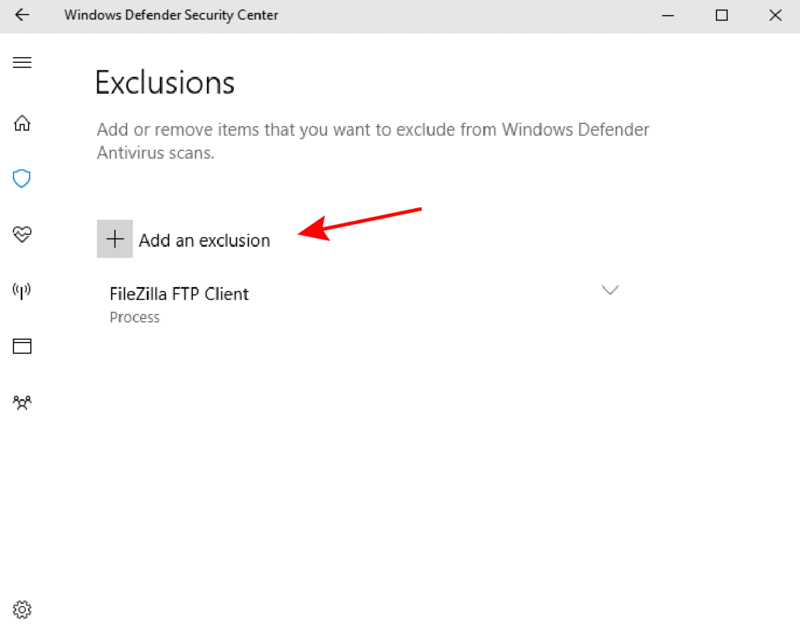 If it is making a big impact, add an exclusion of your FTP software in your Antivirus.To add a FileZilla exclusion for Window Defender in Windows 10. Go to Windows Defender > Virus and threat protection settings > Exclusions > Add or Remove Exclusions. 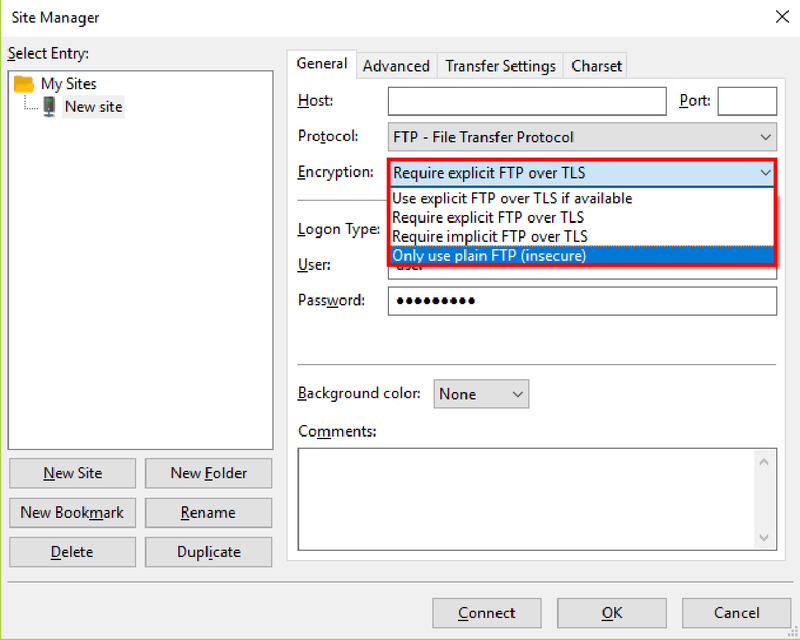 An FTP client like FileZilla, will automatically add firewall rules into the Firewall. The firewall will allow all inbound/outbound traffic related to Filezilla. If Windows allows FileZilla, all ports that work with it will be allowed as well (ports such as 21, 22, 22221, 22222). Unless your local firewall is blocking important ports, the FTP speed degradation is almost zero. As a test, turn off your local firewall temporarily, download a test file from a reliable source and check your speed. Turn it on and perform the same test. If you see a lower performance when the firewall is on, lower the security level of your firewall. Be aware that disabling your antivirus or firewall can potentially put you at risk! Online activities such as streaming, browsing or P2P, can be invasive to your bandwidth. By default, applications and programs are allowed to use as much bandwidth as they need. But having too many using the Internet at the same time will degrade your overall speed. The less other applications consume your bandwidth, the faster FTP client will download. To allocate more bandwidth to FTP downloads, close any other Internet invasive programs. 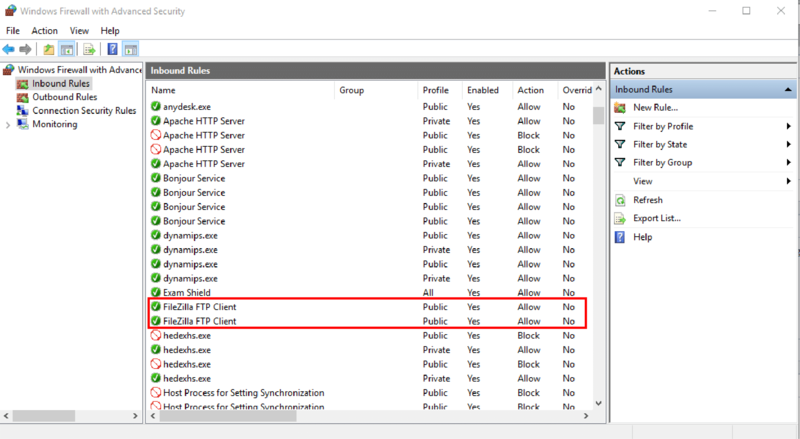 Check the network usage in task manager. If it is Windows, open your Task Manager (ctrl+alt+del). Sort the processes in the Network tab and check the highest consumers. Processes on the top places are the ones consuming more bandwidth. 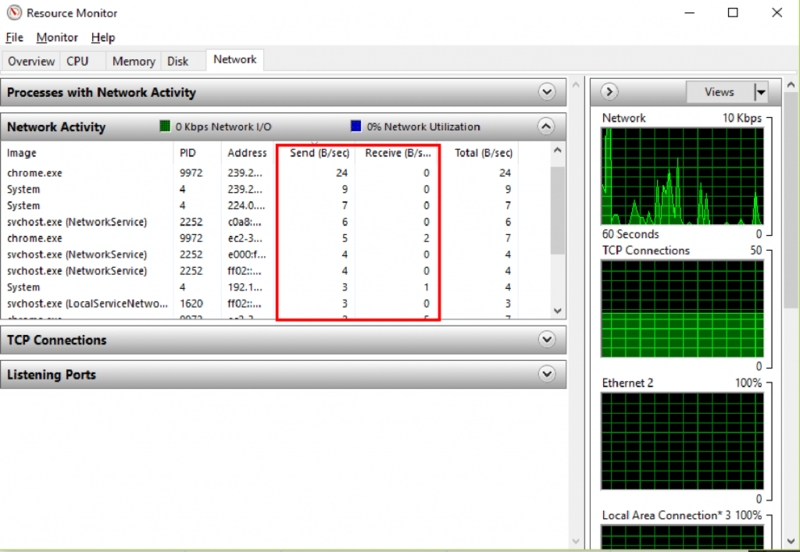 For more details related to network usage in Windows, use The Resource Monitor. 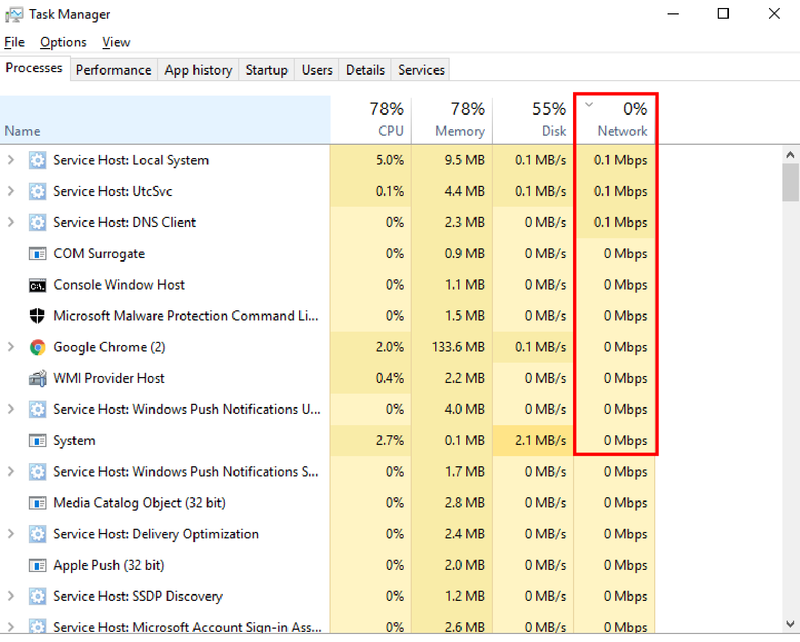 To open it, go to Task manager > Performance > Open Resource Monitor (on the bottom). Go to the Network tab and find Network Activity. It shows a good amount of information on current processes, address and even packets sent and received. WiFi was designed for everyday mobile devices that are capable of high Internet speeds. Latest Wi-Fi standards, such as 802.11n supports a high-speed bandwidth of up to 300 Mbps. High speeds, good security, and flexibility to move around make Wi-Fi a popular technology. But Wi-Fi was not planned for frequent and heavy downloading/uploading. There is something more appropriate. Remove the flexibility and increase speed and security, you have a wired connection. A wired connection, as Ethernet or Fiber can double or triple the speed + security. For serious FTP downloading, avoid Wi-Fi connectivity. Connect right to your router/access point through a wired cable. A VPN adds more factors that can slow down an Internet connection. A VPN client tunnels and routes encrypted traffic towards the VPN server. The VPN server decrypts and forwards it back to the source. This encryption/decryption process adds a small delay in speed. It is a fact, VPN will not speed up FTP speed. But having a secure connection might outweigh the small loss of speed. Plus, a VPN can play an important role to help speed up transfer rates. How? ISPs monitor traffic and shape anything that is consuming too much bandwidth. They limit bandwidth for certain activities, such as P2P, streaming and FTP downloading/uploading. A VPN connection might bypass any rules defined by ISPs that throttle bandwidth. In these circumstances, a VPN tunnel might put an end to bandwidth throttling and help to improve your FTP speed. A common VPN service is OpenVPN. If you have a Server, the VPN client is easy to set up. Follow this detailed guide to install OpenVPN in a Windows PC Seedbox. 5.5 The Internet has also daytime congestions. If you are trying to download something from the Internet at 6:00 PM to 11:00 PM you will likely hit Internet rush hour. Thousands of other users at your local network or ISP might be using P2P or watching streaming TV. According to Sandive, a leader in Internet phenomena, there was a big change in Netflix’s bandwidth after a release of House of Cards. The following picture shows that bandwidth was saturated in peak hours while it decreased dramatically around 2:00 AM. It is likely that the FTP server sits in another time zone and so are other FTP clients. But considering local Internet rush hour traffic is important for big time FTP users.